Can my older students skip earlier content? It is not recommended for any student to skip any concept we teach entirely. Our curriculum is scaffolded, meaning that each concept is built upon previous ones. However, older students might not need as much practice with earlier content as younger students. It is recommended to do at least one lesson plan and one unit of game content for each concept. If you would like manually assign levels for a concept or unit, this can be accomplished via our "Assignments" feature on your Kodable Dashboard. To assign levels, you'll still need to access the lesson plans that are linked to the game levels. 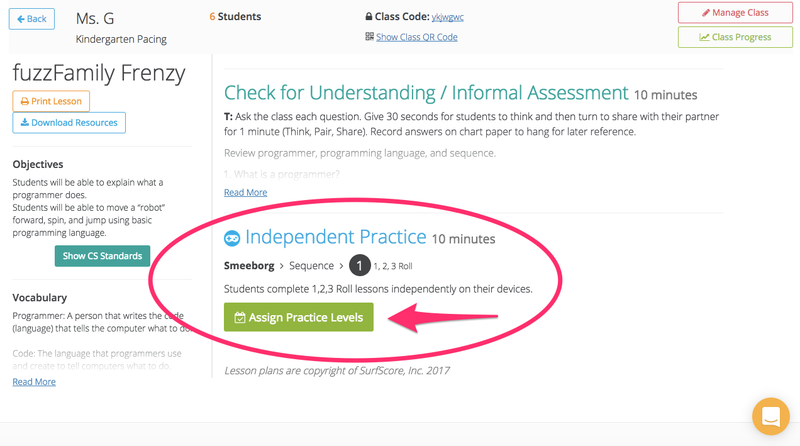 Once you're in the lesson plan, you'll see the option to assign the correlating game levels as independent practice.